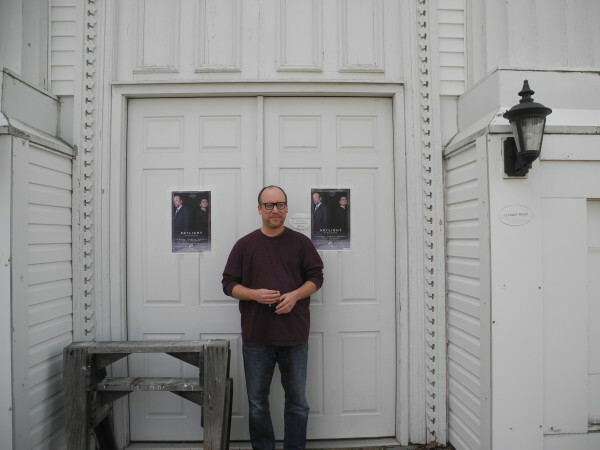 BELFAST, Maine — Jason Bannister unlocked the door of the former Universalist Church that dates back to 1839 and walked upstairs into a dimly lit, chilly sanctuary that used to be where people gathered to worship. This week, people will gather there for a different reason — to watch local actors bring the play “Skylight” to life, with a theater-in-the-round located where pews were once. Jason Bannister, the producing artistic director of the Midcoast Actors’ Studio, said that the newly-named Court Street Theater marks an exciting transition for his company. It’s the first time his actors will have put on a play in their own theater. And it could be something big for Belfast, a city which has not had a dedicated performing arts space for several years, he said. Over the four years that the Midcoast Actors’ Studio has existed, he’s put on plays in the Troy Howard Middle School cafeteria and at a 40-seat storefront theater on Church Street in downtown Belfast that primarily is used for kids’ acting classes. Bannister’s cast and crew needed to work around other people’s schedules, and pack up all props after every rehearsal. Enter the church, which has had many different starring roles in its long life. In the mid-1900s, the Universalists moved out and the Emmanuel Baptist Church moved in. By the 1980s, the Baptists had found a different home and the church hosted its first acting group — the Belfast Maskers, which used it for a short period of time. Then the National Theatre Workshop for the Handicapped, a New York City-based group which established a major summertime presence in Belfast in 1996 and stayed active here for about a decade, purchased the building. After that group pulled out of the area, the church was foreclosed upon, and a family purchased it and partially converted it into a home. Now, those owners are renting it to Bannister and the Midcoast Actors’ Studio as a trial run for the current performance, which will begin its two-week run on Friday night. If things go well, Belfast may have a more permanent dedicated theater once again, albeit one which will need some work. That’s despite the fact that the cast and crew were working on the play before the weather warmed up. The current show should be a positive step on that path, he said. “Skylight,” a 1995 Tony Award-nominated play by David Hare, is set in the flat of an East London schoolteacher. Over the course of an eventful evening, teacher Kyra Hollis, played by Crys Bruschi of Winterport, is visited by Edward Sargeant, played by Owen Scoville, an 18-year-old from Unity. Kyra used to live with Sargeant’s family, and he thought of her as a big sister. But she left their family when her affair with his father, Tom Sergeant, played by Bannister, came to light. Skylight will run Friday through Sunday on May 15-31 at the Court Street Theater at 17 Court Street in Belfast. Performances will begin at 7:30 p.m. Fridays and Saturdays and at 4 p.m. on Sundays. Tickets are $15 for adults and $12 for students and those over 65. On opening night there is a two for one ticket special. For tickets and information, call the box office at 370-7592 or email midcoastactors@gmail.com.